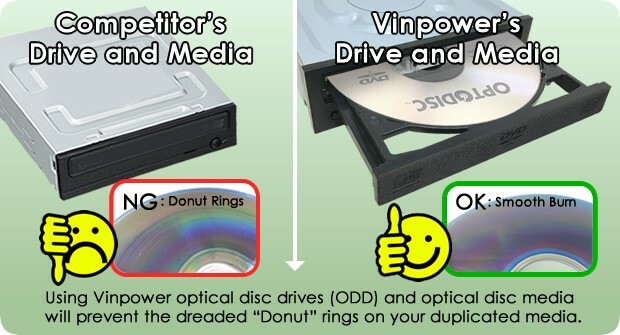 Using Vinpower optical disc drives (ODD) and optical disc media will prevent the dreaded “Donut” rings on your duplicated media. You may have a different term for it, but when you copy a disc and you see intermittent light and dark rings on the burning side of the discs, (“Donut Rings”), that is a clear indication that you are having compatibility issues between your drive and your media. High quality duplication should leave the recordable side of a disc smooth and seamless for the most part. So when you can clearly see light and dark rings, what we refer to as Donut Rings, then that means the drive’s laser would burn harder/more intense and lighter/less intense due to constant stopping and starting, due to problems between the writers and the media. You could lower the burn speed to try and compensate for these issues, but that may not fully resolve the Donut Rings and will greatly increase your duplication time. The Donut Ring is often attributable to the low compatibility between the media and the burner. Since the media and drive manufacturers do not work together to fine tune each item to prevent these issues, there’s not much you can do when you encounter these problems. That’s where Vinpower Digital can help. As the only duplication hardware supplier that provides our own proprietary Optical Disc Drives (ODD) and Optical Disc media (CD, DVD, & Blu-ray), we fine tune both the media and our drives to have the best compatibility to prevent the dreaded Donut Rings and provide the best quality burns. So, if you want to prevent Donut Rings and not waste time burning at a snail’s pace, you should use Vinpower’s drives and media together to ensure the best duplication results! 1. 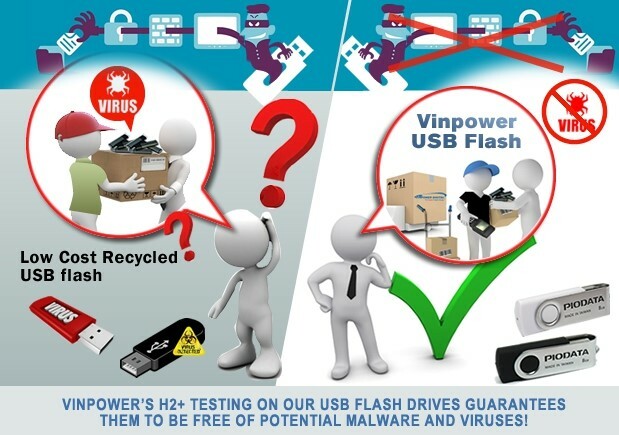 When purchasing blank USB flash drives through Vinpower, our specialized H2+ testing eliminates any possibility of hidden malware or viruses, ensuring the drive is 100% clean when you first receive it. At least that way you know the blank USB drive you receive is safe from the start. 2. Using Vinpower supplied USB flash media along with Vinpower’s standalone USB duplicators, the user can add write protection to a drive after the content is stored on it. The write protection not only prevents the content from being altered or deleted from the flash drive, but it also prevents anyone from adding any potential malware or viruses accidentally or on purpose. 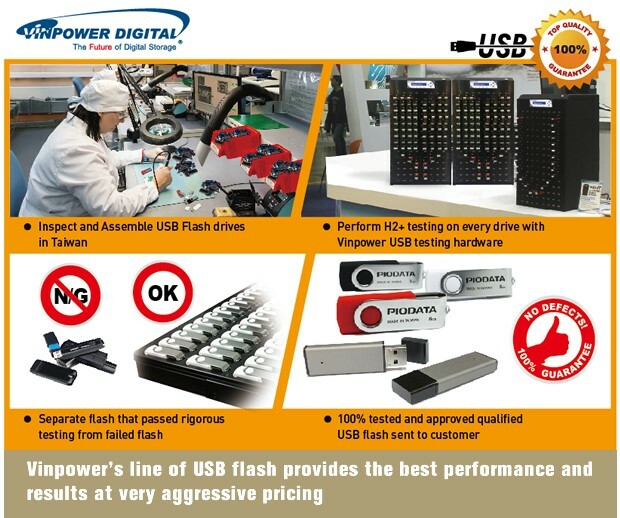 So if you want to make sure that you are receiving USB flash drives that are contamination FREE, visit our website, www.vinpowerdigital.com, or speak with a Vinpower representative today. With surveillance camera becoming smaller, cheaper, and higher resolution, they are becoming a staple in businesses both large and small. Price is no longer a barrier to entry for owning and installing surveillance cameras that blanket all vulnerable areas of a business. Be it a high security government installation or a small mom and pop corner store, they can both feel secure with knowing there are cameras recording what happens. The key then becomes how long can those cameras record content before they run out of space and begin recording over itself, potentially losing valuable footage forever. With Vinpower’s Cronus publishing systems, you never have to lose a second of content. The Cronus can be set up to automatically back-up all your video surveillance onto optical discs through a network server. There are multiple configurations on how you can set up the back-up procedures, which you can then also label each disc with a time stamp or the dates of footage automatically with minimal interaction by the operator. The Cronus can run 24/7 and catalog all the footage for as long as the user wants to keep it. Plus, because optical discs are the safest method of archival storage, you never have to worry about the content being accidentally deleted or altered in anyway. You will be able to maintain all the content you want for as long as you need. The bonus being that optical discs are also the cheapest method of storage, typically just pocket change, with disc capacities ranging from 700MB to over 100GB. If you want the security to maintain your video surveillance and prevent losing critical content from cannibalizing itself, the Cronus is your best option. 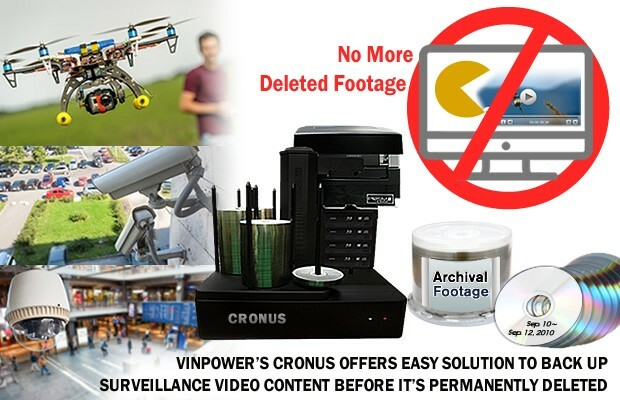 For more details about the Cronus or any of Vinpower’s wide range of products, visit our website at www.vinpowerdigital.com, or speak with a representative near you.